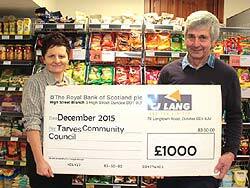 Tarves Community Council have received a generous donation of £1000 form their local SPAR store. Owned and operated by CJ Lang and Son Limited, SPAR Tarves are able to donate their funds raised through the sale of single use carrier bags to charity’s and groups within their local community. Dianne Robertson an employee at SPAR Ardrossan has graduated from STEP the retailer and staff training course.